Green Reading is a Skill and you have to learn to see the evidence that is available on the green. This is about assessing the overall contours of the green, the drainage pattern of water and how the green fits in with the surrounding topography. This will give you an overview of how the green slopes. It is not the same as reading the putt. 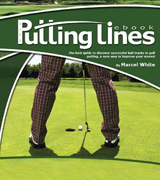 Putt Reading is only concerned with the small piece of the green over which your ball has to travel to reach the hole. 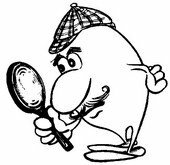 As you approach the green, look around and do some detective work to get a general feel for the different contours. Look for any vertical and horizontal references such as the outline of a distant building or the surface of a greenside pond. The flagstick is not a reliable reference as it can sometimes be seated at an angle. There are a number of general rules for Green Reading such as putts break away from mountains and towards any body of water. However, golf architects use subtle changes in contour to add to the challenge of reading the green. Features such as bunker moundings, swales and tiers can feed the ball in a direction that can be different to the general slope. Greens come in many shapes and typically slope from back to front so that they hold the ball on the approach shot. There are no dead-flat greens. A certain amount of slope is needed to prevent the water from pooling on the surface. Slope can be expressed in either degrees or a percentage. The slope is typically between 1 degree and 2.25 degrees at a fair hole or pin location. In percentage terms this represents a slope of about 1.75 per cent to 3.93 per cent. The trend in golf design is to make greens larger, but with less contours than previously. This allows for faster green speeds as well more pin locations. With more pin locations to choose from the course superintendent can regularly move the position of the hole to reduce excessive wear and tear. 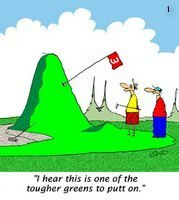 The United States Golf Association’s specification for pin locations recommends that the cup be a minimum of five paces from the edge, but the Professional Tours squeeze this to three paces. This does not make green reading any more difficult. It just means that if you short-side yourself with your approach, you will have less green to work with on your next shot. A rule of thumb for a fair pin location is to position the hole in the centre of a three-foot diameter area that is on the same flat, but tilted plane. A firmly struck putt will break less than a ball that you hit at a slower speed. This means that there is never a single correct line except for straight putts. A putt does not break much in the first two thirds of its roll. This is because the ball is travelling too fast for gravity to have a great effect on it. In the final part of the roll as the ball slows down, gravity and the slope take over causing the ball to curve.